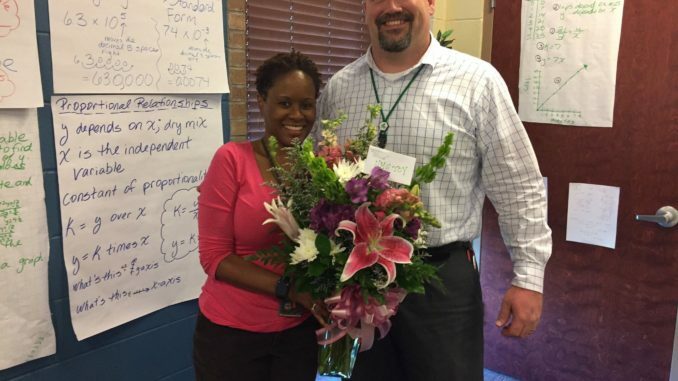 Johnel Robinson has been named Harry Hurst Middle School’s 2016-17 Teacher of the Year. This is Robinson’s 17th year teaching and her sixth year at the school where she has taught a variety of seventh- and eighth-grade math classes, as well as algebra classes. She serves on the School Improvement Team and also participates regularly in planning portions of late take-in professional development for teachers and serves in other leadership roles on campus. When it comes to teaching content, Robinson chooses to create hands-on, interactive challenges to keep her students engaged in the skills they are learning. She utilizes technology often to encourage her students to collaborate and practice their skills in new, engaging ways; and she often lets students collaborate on work to help them understand and practice concepts. “In my opinion, what sets great teachers apart from good teachers is that great teachers acknowledge teaching as their calling, and therefore, they treat it as such,” she said. Robinson will represent Hurst at the district level as she moves on to compete for the district title of Middle School Teacher of the Year.